An hour’s drive south of Rio de Janeiro, the Leaf House is a modern masterpiece that comes with a wooden interior and modern swimming pool. The roof of this architectural marvel looks like a giant flower with six petals, each of which covers a different section of the home. A curved swimming pool works its way through the house before culminating as a small pond stocked with fish and vegetation in the backyard. 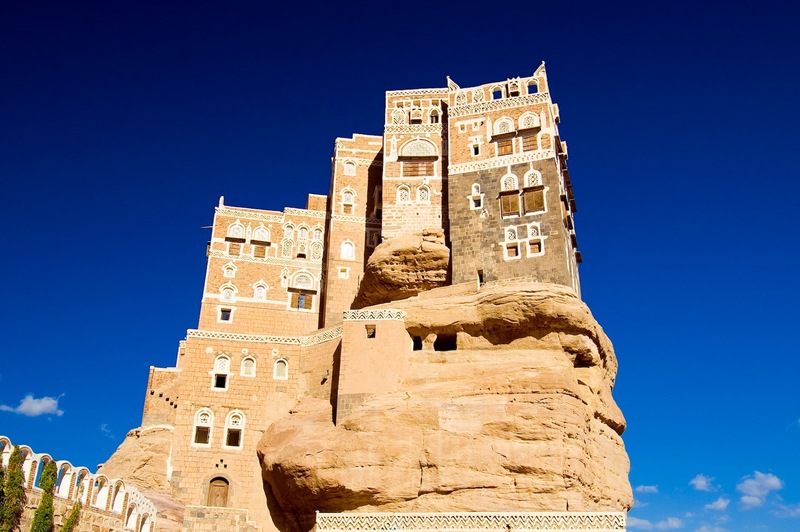 The remarkable rock palace, Dar al Hajar is a stunning example of rock-cut architecture. It was built as a summer home by Imam Yahya in the 1930s. Standing at the base of this imposing structure, you have to crane your neck all the way back to see the palace’s peak. Dar al Hajar has since been restored so that visitors can purchase a breathtaking 360-degree view of its surrounding landscape. Designed in the 1970s by Hungarian architect Antti Lovag for fashion designer Pierre Cardin, the Bubble House is futuristic yet organic, with its built-in furniture and oval, convex windows. It is 35 years old and has yet to be completed, but that hasn’t stopped the French ministry of culture from listing it as a historic monument. 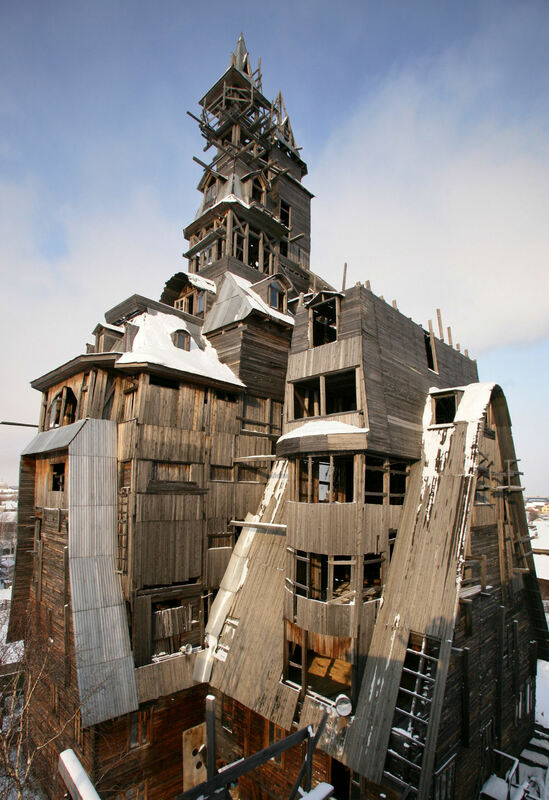 Daniel Czapiewski, a polish businessman and philanthropist built the Upside Down House as a statement. It had something to do with the communist era and the end of the world. It took 114 days to build because the workers were so disoriented by the angles of the walls. The house certainly attracts its fair share of tourists to the tiny village of Szymbark, who often become dizzy and nauseous after just a few moments inside. Nikolai Sutyagin, began building the Wooden Skyscraper with the intention of it being a two-story building. But, a trip to see wooden houses in Japan and Norway convinced Sutyagin that he hadn’t used roof space efficiently, so he just kept on building. The multimillionaire became a pauper after his possessions were destroyed during a stint in prison, and the house is now decaying around him, but that hasn’t stopped him from living at bottom floor of his labour of love with his wife. Klein Bottle House is a beach house designed by the firm McBride Charles Ryan. A Klein Bottle is actually a complex mathematical concept that involves folding a cylinder into itself in order to create an unusual, spiraling form. This notion was the driving force behind the Klein Bottle House, which appears to bring the interior out to the exterior and vice versa. It was named world’s best home at the World Architecture Festival awards, 2009. 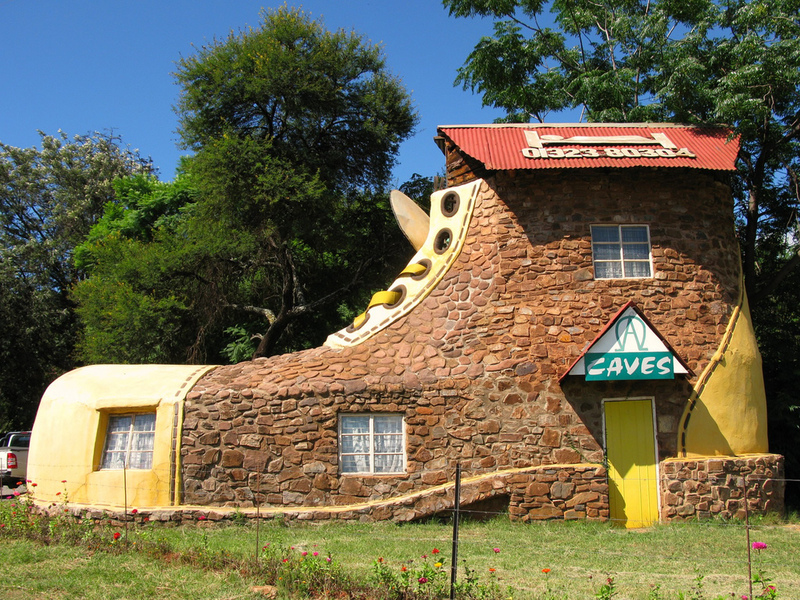 The Shoe House of South Africa is the endeavor of artist and hotelier Ron Van Zyl, who built it for his wife, Yvonne in 1990. The shoe houses a little museum of sorts, showcasing Van Zyl’s wood carvings. The shoe is part of a complex that includes an eight chalet guest house, camp site, restaurant, pool and bar. Curtis King and his sons built the 2,000 sq ft Space House in the 1970. With six concrete support pillars made of cement and steel that look like landing gear beneath the main part of the house, Space House definitely drew a lot of attention from the people of Signal Mountain, Tennessee. It has three bedrooms, two full bathrooms and fabulous views of the Tennessee River. The world’s one and only toilet-shaped house was built to mark the launch of the World Toilet Association, a campaign for more sanitary restrooms worldwide. At the center of the home is a glass-walled showcase loo that produces a mist to make users feel more secure. Sim Jae-Duck, nicknamed “Mayor Toilet”, had the 4,508 sq ft concrete and glass structure built in his native city of Suweon, South Korea. This shell shaped house was built by Arquitectura Orgánica in 2006. A young couple with two children from Mexico City who after living in a conventional home wanted a change, to be more integrated with nature. Taking cues from a Nautilus shell, the house is put together using ferro-cement construction, a technique involving a frame of steel-reinforced with chicken wire and a special two-inch thick composite of concrete spread over it, resulting in a structure that’s earthquake proof and maintenance-free.